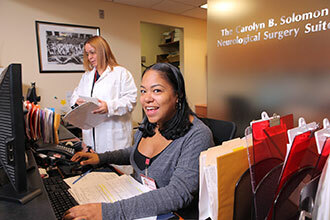 As our patient, you will receive the finest in consultation assistance and surgery by our neurosurgeons. Nurses, technicians, and trainees may assist your doctor during your visit. These individuals have special training and skills that make them an important part of our patient care team. If you are planning your first appointment with us, this page should help you prepare for your visit. Please allow 30 minutes to an hour for your appointment. Your physician will spend as much time needed to ensure appropriate assessment and understanding of your care. Please prepare for possible delays with the assurance that you too will have the time you need with your doctor. Our physicians see patients at multiple locations, so please confirm the location of your appointment. See our locations. The following list will help you remember items and information to bring with you to your appointment. Radiological films (CT, MRI, X-ray). If you have any questions at all before your appointment, please do not hesitate to call. See the Faculty Directory for each physician's direct office phone number.